Fort Lauderdale, July 9, 2018 – Traffic Cones for Less, the nation’s #1 one-stop shop for all road safety needs, announced the relocation of its headquarter to new office space to accommodate the rapid growth and future expansion plans for its Traffic Cone Factory and Custom Applications business. Traffic Cones for Less is pleased to announce the opening of its new office/ warehouse in South Florida. Located in 3590 N.W. 54th St. Suite 9 Fort Lauderdale, FL 33309. The new location allows for additional customer service staff, additional warehouse space as well as a new hands on showroom. The new experience center (showroom) enables Traffic Cones for Less to showcase its traffic safety and crowd control equipment to potential and existing clients, and contributes to the general understanding of the usage of the different products and custom application services. "We were fortunate to find such a well suited and centrally located Broward County location. I don't think we could have found a better location for our team. Our new location and enhanced operational efficiencies will help us continue to grow and develop to keep pace with our clients' needs, allowing us to provide exceptional value and superior service along the way" said Melissa Schechter, President of Traffic Cones For Less. In addition to the new facility OES Global Inc, parent to Traffic Cones For Less has recently added Karen Zinna to newly created Project Manager position and added Susan Dowd as the Account Receivable Manager. TFCFL – the nations #1 Traffic Cone factory direct provider – is a leading e-commerce distributor of road safety equipment. Noted for its full line of traffic cones available in all weights and sizes, including 6”, 12” 18" 28" and 36" cones, they specialize in bulk and wholesale transactions. They also offer a variety of color cones, including orange, lime green, white, blue, yellow and pink. With an extensive experience in stenciling, they customize traffic cones by either adding logos, block stenciling or silk screening to respond to every branding application and budget. This traffic cone leader has warehouses available in 4 different states, allowing them to offer competitive prices and fast shipping. Traffic Cones For Less, a one-stop shop for road safety needs, has introduced a new line of rollup signs. Ideal to notify individuals of significant roadwork and other situations where traffic safety is a concern, these temporary warning signs are used by departments of transportation, power utilities, road contractors, underground utility contractors and more. All rollup signs are available in industry standard 36-inch and 48-inch sizes. Rollup sign sheeting material is available in four options: nonreflective vinyl, standard mesh, reflective vinyl and ORAFOL Reflexite Marathon. Nonreflective vinyl is solely for use in daytime applications. It's made with fluorescent orange UV-stabilized vinyl. Standard mesh is the most economical option. It is nonreflective, flexible, breathable and mildew resistant. Standard mesh is intended for daytime use only. Reflective vinyl is constructed from retroreflective fiber-reinforced nylon fabric that is ideal for low-light applications. ORAFOL Reflexite Marathon is constructed from fluorescent prismatic reflective sheeting that offers outstanding visibility during daytime and nighttime. It contains higher levels of photometric performance, ensuring superior reflectivity at night and in low-light conditions. Traffic Cones For Less specializes in MUTCD-compliant rollup signs available in all legends and overlay options. We also are a full-service custom silk-screening facility; custom legends are available at no additional charge and with no minimum order requirement. PINK TRAFFIC CONES? WHO KNEW? 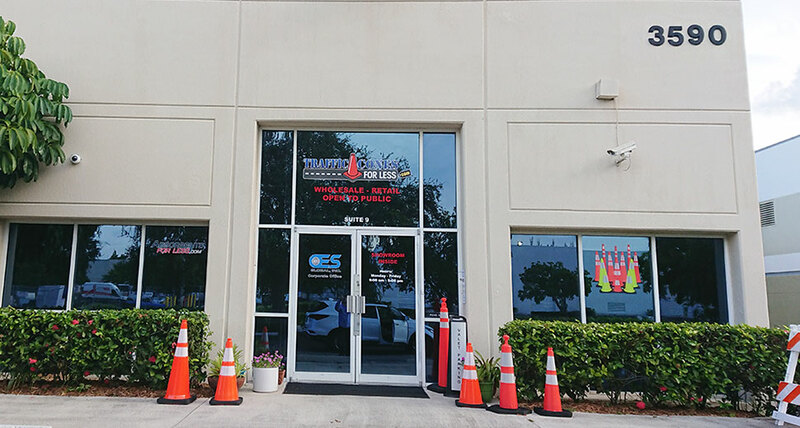 Fort Lauderdale, FL: Pink IS NOT the color you expect to see on traffic cones; however, the management team at OES Global Inc, (parent to Traffic Cones For Less) one of the nation’s leading traffic safety sellers, based here in Fort Lauderdale, saw an untapped market. October is breast cancer awareness month; a month where millions of people across the United States walk the streets to fight against breast cancer for 3 to 5 miles. In 2016 alone, 1.4 million walkers across the country hit the streets to raise more than $60 million to help finish the fight against breast cancer. 2017 is predicted to be even higher. Organizations, businesses, passionate individuals, who commit to organizing making stride events against breast cancer, can now use pink traffic cones to make their events both safer and continue to promote the message by maintaining the pink theme. “We can also fabricate cones to PMS match a specific logo. 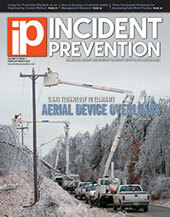 Our graphic capabilities are exclusive and unique in the traffic safety and crowd control industries. We are all about exceptional customer service and offering products and services that allow us to provide an unprecedented line of traffic safety products” Schechter continued. 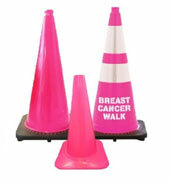 Traffic Cones for Less also provides stencils, silkscreens and full color digital graphic applications to customize traffic cones, as well as a full line of road safety equipment. For orders, questions or comments contact sales@trafficconesforless.com.